Skin problems are hard to avoid. No matter how hard you try, time to time, you might get rashes, points, moles, etc. depending on various factors. Sometimes, people also get reactions from some skincare products. In such cases, it could be really handy to quickly get skin checked for potential symptoms and skin problems. In this article, I will cover a free online service to check your skin. Skinive is everyday skin symptom-checker service which you can easily access anytime right on your mobile phone or PC. This service is available through chatbot for Facebook Messenger and Telegram. You can go with any of these platforms to use this service. All you have to do is send a photo of the skin area which you want to get checked and this service provides personalized guidance and helpful information. Skinive respect user privacy, the photos you send are analyzed by algorithms, there is no third party or human interaction involved. How to Get Skin Checked with Skinive? The process of getting your skin checked for potential symptoms is very simple with Skinive. 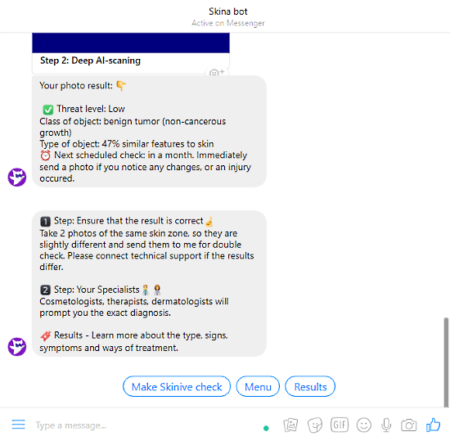 All you have to do is visit the Skinive website and from there you can use this service either via Facebook Messenger or Telegram. To test this service, I used Facebook Messenger option; you can use any of them as per your convenience. After the login, you can get your skin checked in three simple steps. 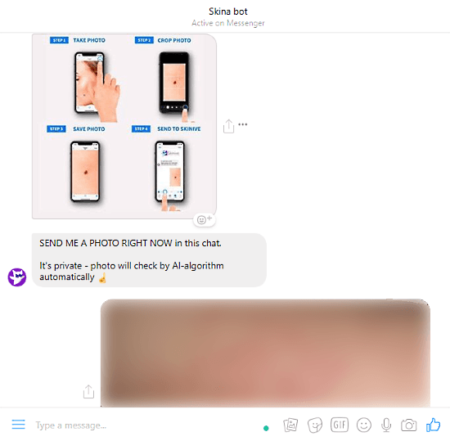 When you log in to your Facebook Messenger or Telegram, it takes you to a conversation with Skinive bot. This bot shows you how to use the service. It gives you conversation suggestions to get the things started. Then, it asks you to upload an image of the skin zone which you want to check. It gives you guidelines on how to take a photo that can be easily analyzed. 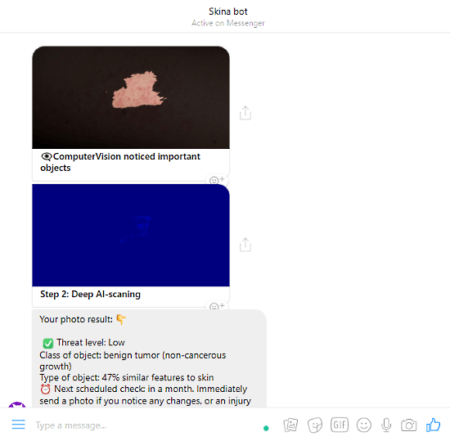 Once you upload the photo, this service uses ComputerVision to notice the skin area and then apply Deep AI-scanning to analyze that for potential symptoms. Threat Level: Tells how serious the problem is. Class of Object: Tells the possible potential cause for the problem. Type of Object: Tells how the object/problem affects the skin. Next Scheduled Checkup: Suggests you when to get the next checkup. To double check the results, you can again send two photos of same skin zone taken from slightly different angles. Self-check your skin with Skinive here. Skinive is a free skin symptom checker service that you can access anytime right from your mobile phone or computer. It could be handy for everyday self-skincare. You can simply take a picture of your skin zone and get quick guidelines by sending it to Skinive. Do note that, this service uses algorithms and database to check skin via photos, so, don’t completely rely on this. In case of something serious, you should definitely consult with a specialist.